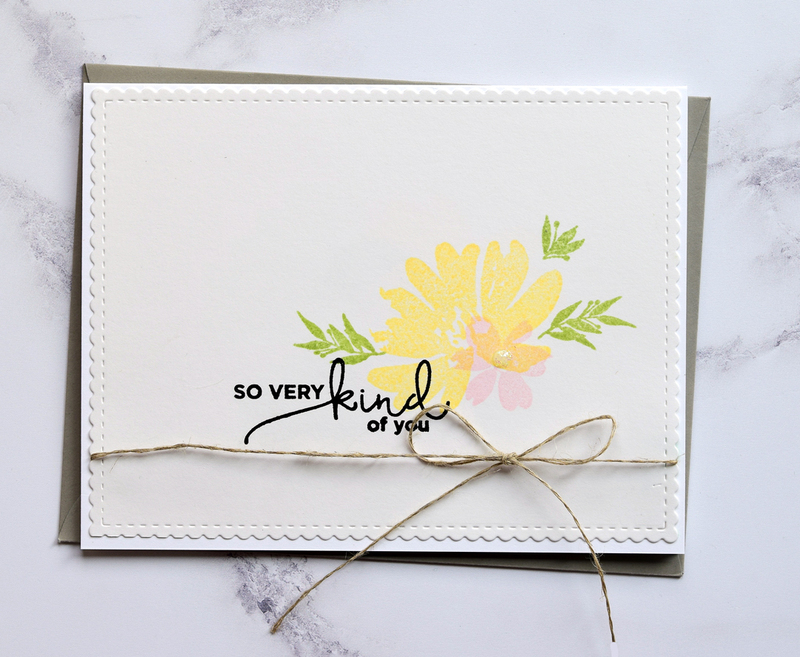 Used two of the flowers and the sentiment in Watercolor Bouquet by The Stamp Market to make this soft card. There's a Blizzard Nuvo crystal drop in the center of the pink flower, and for some reason I think it is so very important that you know this! Speaking of things worth knowing, did you see that the owner of the MISTI got a patent? I'm so happy for her -- a former customer who has now sold MILLIONS of these things and making serious money (did a little googling and found that number in some legal papers)!!!! Good for her. MOOD WHEN DONE = If you saw the cyclone of tried, but discarded, cards in my craft room right now, you'd know I'm sighing with relief that I made something I like! I'm headed back to Boston on Sunday for another medical appointment, where I hope to get some final answers. I'm a little (ok, a lot) frustrated so I'm trying my best to keep perspective. I've got a pretty good gig going, life-wise, so I'm taking some deep breaths, and making believe I'm chock full of maturity and wisdom. Thanks so much to all of you who are holding my hand virtually! If you celebrate Easter, I hope it is a a good one! Deep, cleansing breaths. Praying you get good answers in Boston...and thank you for such a lovely card to brighten my blog reading! Will be thinking of you in Boston. Such a gorgeous card, pretty colors! 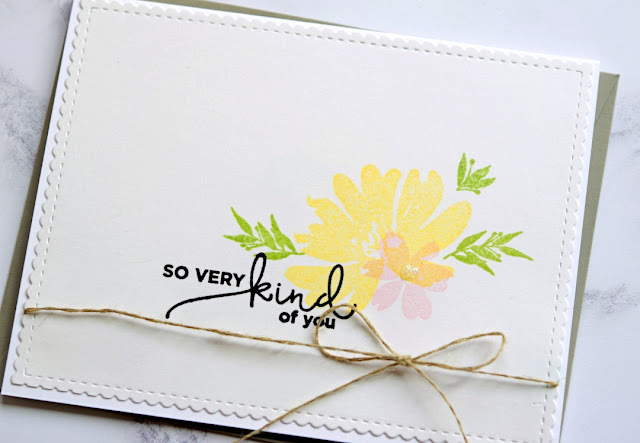 Your lovely card makes me happy just looking at it! Love the simplicity & soft colors. Sending prayers for good answers in Boston. Sending good vibes for the trip to Boston. I'll stand by your side virtually and hold your hand through it all. You're walking right into and through the tough stuff which takes so much courage. Keep breathing. Best of luck this week, Joan. I'll remember you in prayer. Good luck with your appointment, Joan. Maybe you will get to see a little of the marathon while you are here. The weather will be beautiful. It is very pretty and sweet. I can't resist a yellow, pink, and green color combo. You have a cyclone, I have an explosion. Good luck in Boston getting answers you can work with. You know I saw the post on My sweet Petunia's blog and I was so happy for her. Seeing the blatant copy from another stamp company at Michael's this winter really upset me. Good luck in Boston and stay positive! I like your card also, by the way.